We have all heard some variation of “don’t jump to conclusions.” We all have made the mistake of doing so, and usually feel foolish when we hear all the facts and information. When it comes to Line 3, jumping to conclusions is being taken to a higher level. People who see the need to come to Minnesota are continuing to play this game of exaggerating “facts” and missinformation (and they are good at it) to such a point that others with a thirst to “be first with the news” react before they know what’s true. This past week, a group of professional activists who are against replacing Line 3 did just that. Their target for the game was a long-planned road construction project in Clearwater County. Crews were working on one of three mill and overlay projects that by coincidence intersects with the Line 3 replacement route. The work is part of a regularly updated five-year road maintenance plan that county officials said does not have anything to do with replacing Line 3, but they claimed “they stoped Line 3 construction today”. Well, No permits have been issued for the Line 3 project. The road construction project HAS NOTHING to do with Line 3. Yet lets not let facts get in the way of a good emotional outburst… the protestors decided to claim the construction work was a part of the construction to replace Line 3. They held a ceremony, set up barricades to the road, sent out a news release, and forced construction work to stop. 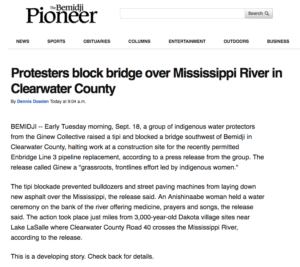 While most of us knew the claims were false, an unsuspecting reporter jumped to reach the protestor’s conclusion that this was indeed a project connected to Line and published a story on the Bemidji Pioneer’s website. In an effort to be “first to the news” the story then hit the raging river of social media and instantly spread across the internet – even though the story was wrong and the claims were false. Based on how fast the false story spread across Facebook and the web, I am sure that many individuals saw this initial story and reacted. Some may have been “surprised” that such a high-profile project had all the approvals needed to move forward. Others may have wondered why others had not shared this information with them about Line 3. It’s clear many others shared or liked the story as a way to show support for the protestors. All of this is based on something not even remotely true. The fake claim shared by people to get others to make that leap to a false conclusion. It took the newspaper a while to update this article to have the correct information, but this is clearly a game people opposed to Line 3 will continue to play. Though supporters of Line 3 have different views and opinions than the opposition, there is a valuable lesson that we can take away from this incident. No matter how passionate we are or how strongly we feel about the events that unfold in the coming months, we all need to take a step back and be smart, cautious, and careful about our actions. More specifically, we need to be thoughtful about how we react to the actions of people who have differing views about the project. This is just the beginning. Whether it is flying in professional protesters from out of state or halting construction, it is inevitable that the opposition will continue to use tactics that will evoke strong emotions. We cannot jump to conclusions or act on our emotions. We all need to be smart. We all need to make sure we have the full story and all the facts before we react to any events that unfold in the coming months. Minnesota is better than what the out-of-state activists represent. I believe we all can and will rise to the challenge of being mindful of actions and reactions as the permitting process moves forward. Playing games with facts, information and emotions only works if you can get others to react and do things they never would intentionally do. Take the high road and we can end the game now and do what Minnesota does best – work together.